Update February 2019: Help us reach our stretch target by 31st March! Thanks to you we smashed our initial £30,000 Crowdfunder target! This will enable us to move the Library and cover the basic refit of the new building. We have also received close to £20,000 in off-line donations, from generous Trade Union branches, feminist organisations and individual donors. We are immensely grateful to each and every supporter. We now have a stretch target with the aim of raising £65,000 to cover the whole cost of the refit! Although we have raised enough to ensure our collection is safe, we really need this final amount to make a proper home for the Library. Due to offline donations, we only need to reach £48,000 online to reach this goal. Please do donate, we are very nearly there! We are very excited to announce that we have found a new home to move into, the Sojourner Truth Community Centre at 161 Summer Road in Peckham. The building has great potential, but it is very expensive to move a library! We are launching a Crowdfunder campaign, running from 16th October until 9th December 2018. We need to fundraise urgently and are asking for your support to help raise the £30,000 needed. All money raised will go towards fitting out the new space, moving the thousands of books, and the legal costs of moving a library. Massive thanks to everyone who has supported us so far on this journey, signed our petition, donated and volunteered, it has made an enormous difference. We look forward to your continuing support for the next exciting phase of our journey. Our fight is far from over, as we still need to fundraise to afford higher rental costs, to make our units ready, and provide new shelving and other equipment. If you love the Feminist Library and would like to see us continue, please consider becoming a Friend. From as little as £3 a month (or the equivalent each year), you can help preserve Feminist Herstory and our priceless collection of books, periodicals and archives. We launched a wide-scale campaign to fight the council’s decision, gaining international support, positive media coverage and 16000 signatures to our ‘save the library’ petition. 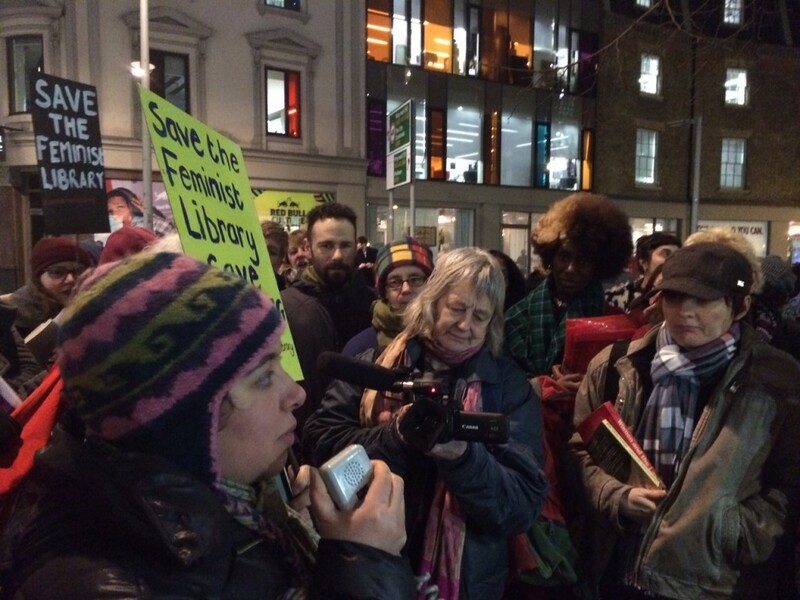 We also held a successful ‘read in’ protest, where members of the public gathered to read feminist books. Thanks to this massive show of support we had a reprieve, but now as the building is due for redevelopment we need to finally move premises. Donate to our Crowdfunder campaign. Become a Friend and set up a regular donation. Regular donations, even small ones, help us to make future plans. Ask your union branch to make a donation to our fund (we can supply a draft motion). Put on a fundraising or support event. Show support on Facebook and Twitter, and tell your friends how much the library means to you. Include a legacy for the Library in your will. Visit the library to browse, use our collection for research or arrange a student visit. Cheques should be made payable to “The Feminist Library” and should be sent to The Feminist Library, 5a Westminster Bridge Road, London, SE1 7XW. We have an incomparable collection of over 7,000 books, 1500 periodical titles from around the world, archives of feminist individuals and organisations, pamphlets, papers, posters, and ephemera. We publish our own zines and support independent producers by archiving and selling their material. Our approach is intersectional – we provide a space for different feminisms to co-exist. But all of this is in danger – our situation is emblematic of the climate of austerity, with many libraries and women’s organisations being forced to close, and pressure on all community resources coming from rocketing property prices, especially in London. As the feminist movement of today grows, The Feminist Library can safeguard its history, and be part of its future. But we cannot do this without the support of the wider community.